This three bedroom four and half bathroom penthouse is able to fit a small family of 6 or 3 couples traveling together. With the large windows and multiple balconies you won’t be able to miss our beautiful sunsets! This penthouse is full of Natural Light with a décor that follows the classic lines of the architecture at Plaza Central building. You will arrive at an elegant atmosphere worth of the penthouse views. The interior color is inspired by the ocean's softness, which provides a relaxed and cooling effect matched with layers of ambiance that follow panoramic sunsets. The art is reinterpreted photography snapshots of the surrounding nature at Las Catalinas handpicked by the owners to portray their love for nature and Las Catalinas. This beautiful Penthouse has an inviting living room with astonishing views and a 48” TV for a family gathering. Adjacent to the living room you will find the fully equipped gourmet kitchen with top of the line appliances and granite counter tops.The dining room also enjoys great views! You can enjoy any meal of the day while soaking the colors of the sea. The master bedroom has Panoramic Views with the door to ceiling doors. 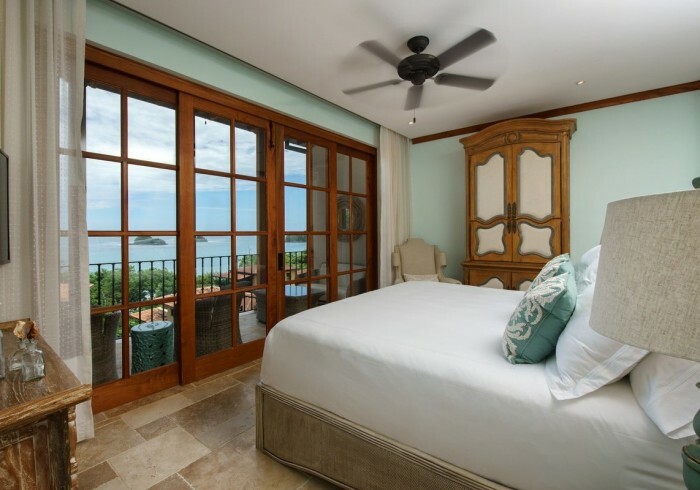 This bedroom has a King bed, private bathroom, AC, ceiling fans and a private terrace with the perfect location for an early morning coffee or a cocktail during sunset. One of the guest bedrooms have a king bed and a private balcony while the other guest bedroom with two single beds enjoys the views of our beautiful mountains. Both bedrooms have their own private bathroom as well as A/C and ceiling fans.